As you can no doubt see from my various posts the West coast of the Western Cape is well worth a visit. Most people when visiting Cape Town tour the Winelands or the Cape Peninsula which are both spectacular, but differ drastically from what you would see on the West Coast. Not only are the people different, the plant life is different and spectacular when it flowers in early spring, but also the scenery along the west coast is different to what you will see around the Cape Peninsula. Places such as the Langebaan lagoon have stunning scenery which simply should not be missed and to make it even more interesting also has some interesting history as well. 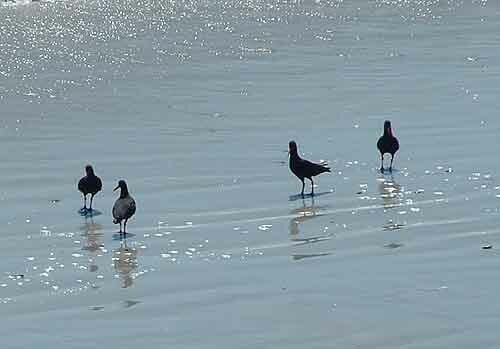 In this post however I am going to show you some of the wild life you can see along the west coast. 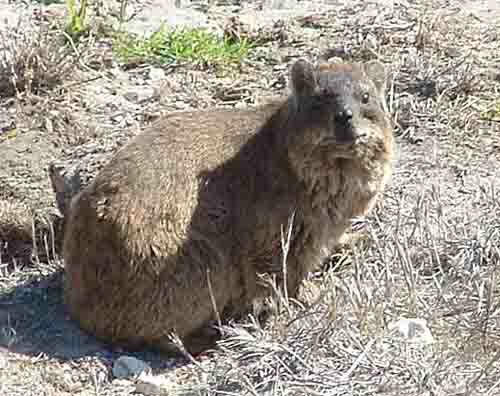 It's not the Big 5 but its wild or classed as wild although some of them they may be found in a game reserve. Kelp Gulls are aggressive predators and they take every conceivable opportunity to steal the chicks and eggs of the African Penguins,the Cape Gannets, cormorants, terns and Hartlaub's Gulls. 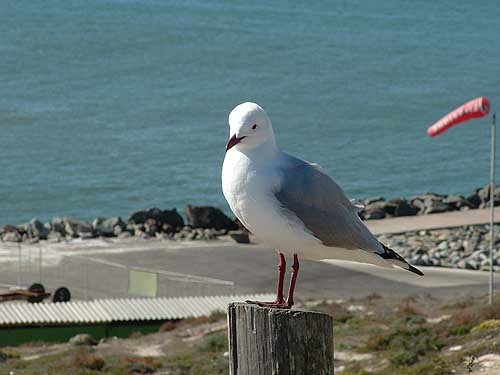 You can find them in large numbers at the waste dumps in and around the Cape Peninsula. The African Black Oyster catcher is the largest of all the species of oyster catchers and is on the endangered list. 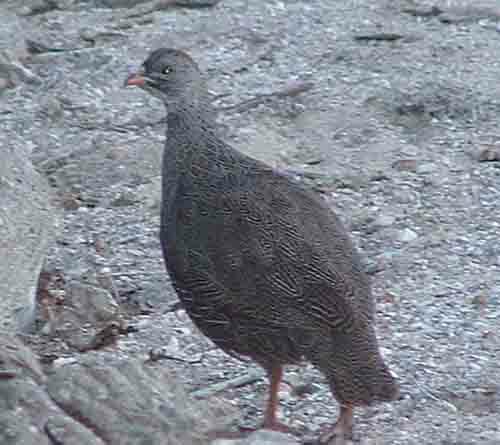 Adults have jet black plumage, pinkish legs and a long, dagger-like orange-red bill. In addition its eye and eye ring are red. Females are larger than males. Along our coastline you will notice them on the rocks and beaches at low tides pecking away at shellfish and anything they can find to eat. They are one of the few birds who forage at night. 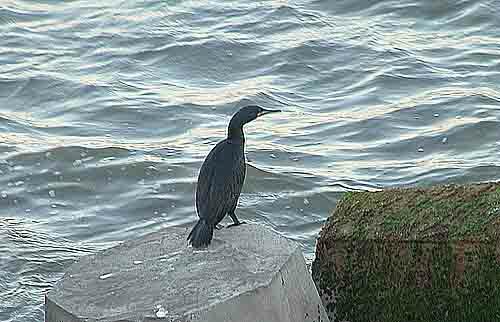 The Cormorant is endemic to Southern Africa and breeds along West Coast. Their prey is fish, crustaceans and cephalopods and they feed mainly in the kelp beds along the West coast where their prey is found. 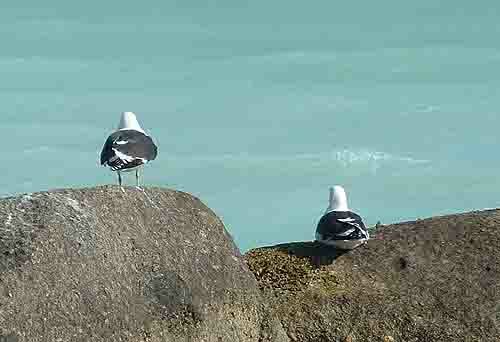 You can often see them sitting on rocks hanging their wings out to dry. 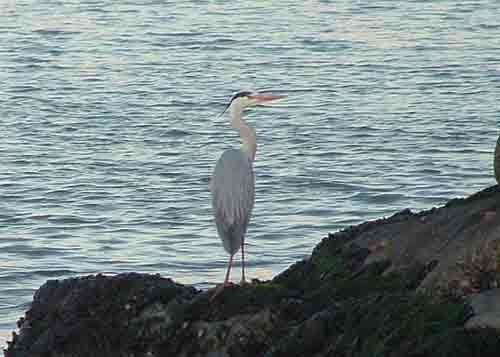 Above is a heron fishing off the jetty at Yzerfontein. You normally see them in the veld but this one was on the rocks trying its luck. 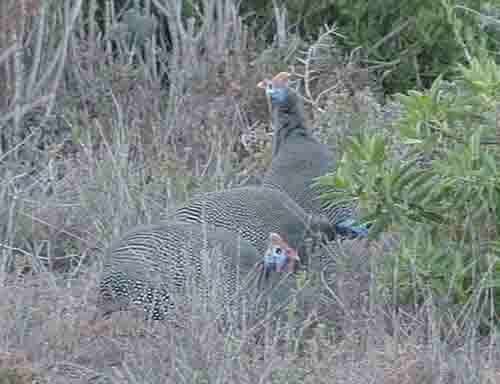 Guinea fowl roam the veld along and the towns along the coastline. They are pretty noisy and can wreck a garden as they scratch in the sand and fight over their food. These birds are also known as pheasants and roam the veld and streets of west coast villages looking for food. I am not an expert on birds and especially not raptors. This one was however very interesting as I saw it flying about in the veld and then suddenly disappear. 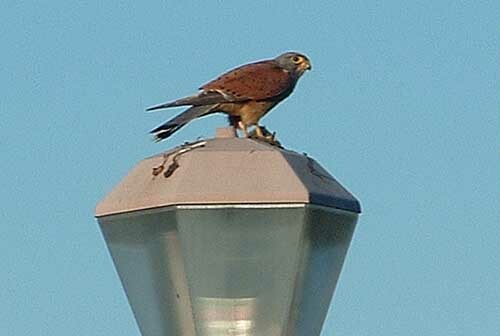 The next time I saw it it was sitting on top of a street light eating its prey. I think its a kestrel. If any one can identify this bird for me please let me know by writing a comment. Thank you. The hyrex which looks nothing like an elephant is apparently a distant relative to the elephant. These little chaps can be found in and amongst the rocks along the coastline at Yzerfontein as well as living in the drains along new roads in the area. As they have no enemies (their natural enemies are usually leopards) they tend to live in large colonies. 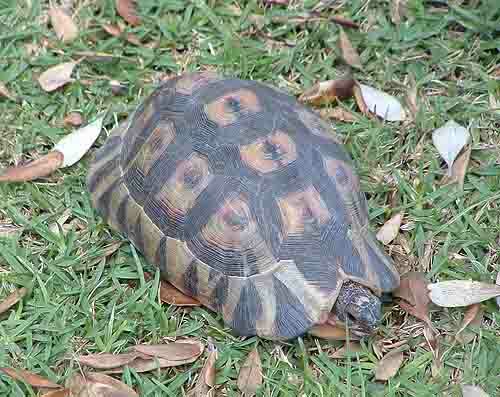 Above are two tortoises which I have found on the west coast. 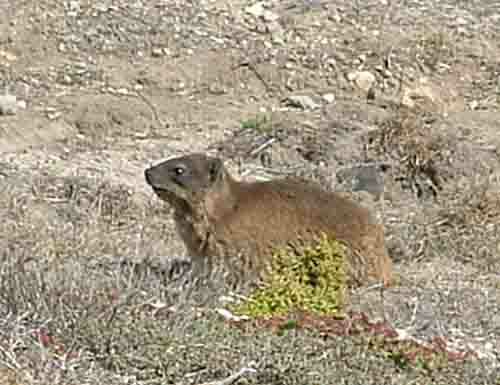 These two live in the veld and visit our home in Yzerfontein to eat gooseberries and find water. 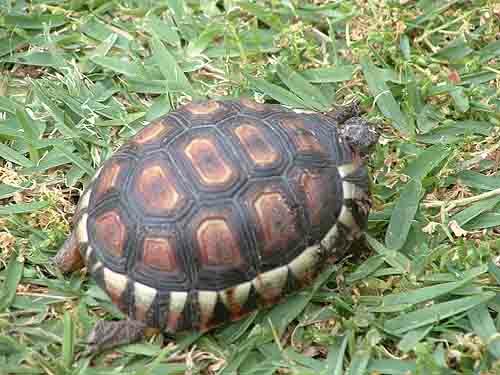 They appear to be slow creatures but can move very quickly especially during the mating season. 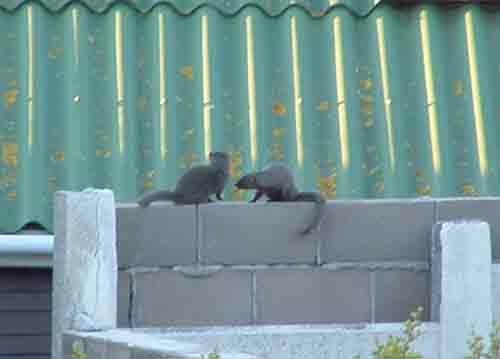 The two mongoose in the photo below have lived in the veld close to our home in Yzerfontein for years, often sneaking up to us through the bush while we were braaing (barbecueing) They disappeared for awhile but have returned to the area.